Ed Malloy, mayor the small southeastern Iowa town of Fairfield, says the Maharishi University of Management that began in his town more than 30 years ago has brought a wealth of economic diversity. "Most companies started very small," Malloy told West Virginia University's State Journal. "Some have grown as many as 500 employees. Businesses have been sold to Fortune 500 and Fortune 100 companies. Over 3,000 jobs have been created as well." 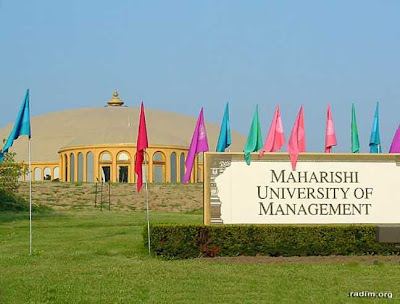 Maharishi International University was originally founded in Santa Barbara, California in 1973 by Maharishi Mahesh Yogi, a person who believed that transcendental meditation held the key for meaningful learning. As the small facility there filled, the group learned that Parson's College had closed in Fairfield and that its large campus would be placed for sale. The university was soon accredited and began to offer its first doctorate programs in 1979. The school changed its name to Maharishi University of Management in 1995, and remains committed to "consciousness-based" education to unfold creative potentials that would likely otherwise go unused by individuals. Malloy told the West Virginia press that the twice-a-day meditation practices of those attending the university has "created a softening influence in the areas of crime and well being" in the area. "This has been very good for our city. It has grown to be a cultural center in theater and the arts," he said.